Chester Martin: In Search Of The "Guardian Eagles Of Lee Parkway"
I mean the "original" Lee Parkway, of course - the one begun by building contractor, and highly competent amateur sculptor WYNSTON BLAND. Does anyone still remember him? He left us many years ago, as did his son of the same name. Now, very recently, some of his family has contacted me in regard to his Lee Parkway development near Lee Highway and Shallowford Road. Mr. Bland (Sr.) had laid out a large parcel of land with a central road through it. This was (and is) "Lee Parkway" which turns north off Shallowford - just west of the Suntrust bank, which was part of the original development. Mr. 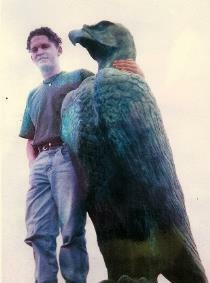 Bland had personally sculptured two large bronze "guardian eagles" which faced one another from atop tall brick pedestals on either side of the central road. These guardian eagles remained in place, becoming landmarks in the area, for many years - until Shallowford Road underwent a necessary widening sometime in the last decade or so. Time passed, and Wynston's family happened into the Chattanooga area from out-of-town just to visit their predecessor's old haunts, and saw immediately that the two eagles had been removed. Inquiry on their part concluded that the two birds would be returned to their approximate original locations as soon as the Shallowford Road idening was complete, but this did not happen. As Wynston Bland had employed me to paint the long, narrow mural over the bank's teller cages in the 1970's, I had become familiar with several of his pet projects which included decorative relief panels and some amazing glazed tile work - a lot of which he used to tastefully decorate the facade of the bank. He was constantly thinking up creative ways to decorate otherwise dull surfaces. A large display of his relief panels stood beside the westbound entrance to the Brainerd tunnels for a long time, but were removed years ago. Sadly, even the tiniest fragments of his creative works have been lost through the years due to normal wear-and-tear, building modifications - and road widenings! (Last such fragment I knew about was located near the large giraffe at the entrance to Goony Golf on Brainerd Road, but this seems now to be missing as well). So, when contacted by his remaining family to see if I knew the whereabouts of the Bland eagles, I was immediately interested. Fortunately they sent me the two Polaroids which included one of those birds. Funny how the sculptures seemed so much more diminutive in the field than compared with the young man in the photo, where they seem huge. (There was also a third bronze statue of a reclining female figure which Mr. Bland placed in the center of the roundabout near the end of his Lee Parkway driveway. Only a flagpole and some shrubbery are there today. All three Bland sculptures are still "missing"). I was always impressed with Wynston Sr's. creativity, and his willingness to pay for "extra" adornments for his buildings out of his own pocket (as with my mural, which was his "gift to the bank", as he phrased it). A native Virginian, as I believe he was, he paid close attention to the various "bonds" of brick as seen at Colonial Williamsburg and elsewhere in Virginia - and that he included in his Lee Parkway buildings. 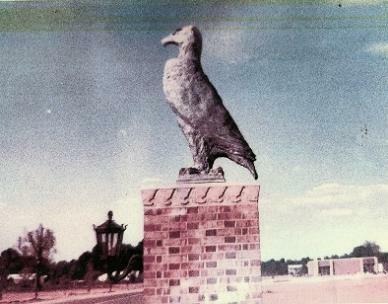 You can see some of it on the eagle pedestal in one of the photos. No art student was ever more observant than he - it was like he was constantly trying to absorb all the good out of every situation, and every occasion provided a "moment of learning" for him. Now, let's all don our Sherlock Holmes sleuthing hats and try to locate those missing eagles eagles! Please include the "reclining female figure" in your searches, as well! Just drop me an email to CYMPPM@COMCAST.NET if you learn (or know) anything!